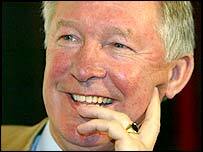 Sir Alex Ferguson's new four-year deal as manager of Manchester United is expected to be ratified on Friday. The latest news from Old Trafford plus fixtures, results and a guide to Old Trafford. Fixtures, results and all the latest news Plus: a guide to the Reebok. City goalkeeper David Seaman should be fit for Saturdays derby at Old Trafford despite being substituted during the game at Everton. Seaman is expected to recover from his recurrance of a rib injury by the weekend. City have been drawn at home to Leicester in the 3rd round of the FA cup.